OnePlus One users who are waiting for the latest Offical Full ROM zip File. Now the Cyanogen OS 13.0.1 (6.0.1) ZNH0EAS2JK Signed Flashable Zip is available. And You can use the same on your Rooted or Non-rooted Oneplus One and update your phone with the latest Android 6.0.1 Marshmallow. Here in this new tutorial, we’ll show you how to download and install the latest Cyanogen OS 13.0.1 (6.0.1) ZNH0EAS2JK on oneplus one. This method will work on both the rooted and non-rooted phone. All you have to flash the zip file with your TWRP recovery or Stock Cyanogen recovery and you are done. The process is very easy and it will not wipe any data or your files from the phone. The guide is only for the oneplus one users and don’t use the below mention method any of the android smartphone. Read all the steps very carefully and do take the full backup of your Oneplusone Android phone. Step 1. 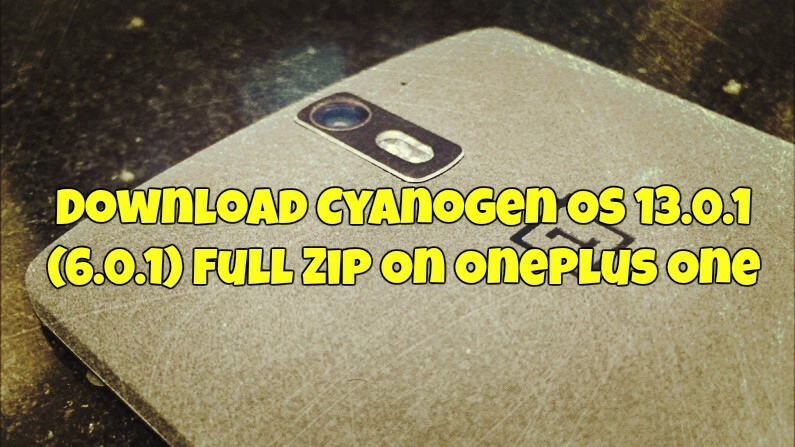 Download Cyanogen OS 13.0.1 (6.0.1) Full Zip from here and save the zip file on your phone’s internal memory. Step 2. Now Switch off your Phone to boot in recovery mode. Reboot into recovery by pressing power+volume down button . Step 3. Once your Oneplus One on the Stock Recovery or TWRP recovery. Go to wipe and wipe cache before flashing the Full ROM zip file. Step 4. Now go to the Install option and browser for the Full ROM zip file that you downloaded in Step 1 and Select it to start the flashing process. Step 5. Now the flashing process will start on your phone and it will take few minutes to complete the process. Step 6. Once completed, GO back and Reboot system. The first boot will take some time to finish the updating process. Now you phone will boot into Cyanogen OS 13.0.1 (6.0.1) Android Marshmallow. Enjoy!!!! HI, thanks for all, my one plus one is perfect with cm13 but unfortunately, i lost my data (music, video and pics). so, there is any way to recovery my data?